It’s finally the end of the road for Detective Hank Palace. The asteroid which has been hurtling towards Earth on a 100% confirmed collision course, primed to wipe out all life on the planet, is on final approach. Society is duly crumbling even further. Infrastructure has collapsed, the government has bugged out and gone home. And yet Palace still won’t lay his badge to rest because he has one final case to wrap up. Before the end he must find his wayward sister, make sure she is safe just one last time. The premise for World Of Trouble, concluding chapter of the Last Policeman trilogy, takes us squarely back into detective noir territory. Strip away the asteroid and the surrounding panic and what you’re left with could have come straight out of Dashiell Hammett. Girl falls in with a bad crowd, disappears, detective has to track her down. Along the way complications ensue. A cold trail, a half-dead girl and a missing bad guy. That the world happens to be going to hell in a handbasket all around almost becomes a footnote. What lifts it above the rest of the crop isn’t the sci-fi backdrop thought, but the character of Palace himself. No weary, hard-knuckled bruisers here; he’s the polar opposite of the usual jaded noir anti-hero. Hank’s still a rookie more or less and, though no naive fool, his sense of duty propels him forward with relentless force. Between his urge to finish his case no matter what and his unswerving desire to simply do what’s right he’s an uncommonly positive protagonist. For me that’s what has made the Last Policeman trilogy one of the finest and most refreshing book sagas of recent years. What could easily have turned into another grim, grimy, gritty tale of societal collapse in the face of impending doom has instead been masterfully transformed into an overwhelmingly upbeat tale. It’s not all sunshine and rainbows obviously – given the subject matter that could never be the case. But there’s a thread of optimism running the whole way through. Right up to the inevitable final page I was suffused with a sense of calm. Not thinking that everything was going to be alright, nothing so foolish, simply content to know that someone out there someone was keeping his head. 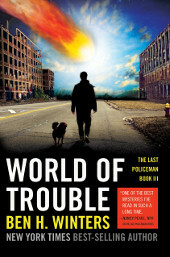 If you’ve already read the previous two books then you are in for a treat with World Of Trouble. It wraps up the tale perfectly, pulling no punches yet never succumbing to the hysteria seizing the world in which it’s set. If you’re new to it then get to the bookstore and buy all three. Settle into a comfy chair and prepare for a journey.